It’s friday night and a few things have happened in the past couple of days: most importantly I have left Kentucky today and will be in Illinois for 2 nights before crossing the Mississippi to enter Missouri. The last week has been as hot and humid as expected. It feels like a sauna with temperatures up to 40 degrees Celsius (over 100 F) and about 90-100% humidity in the air. 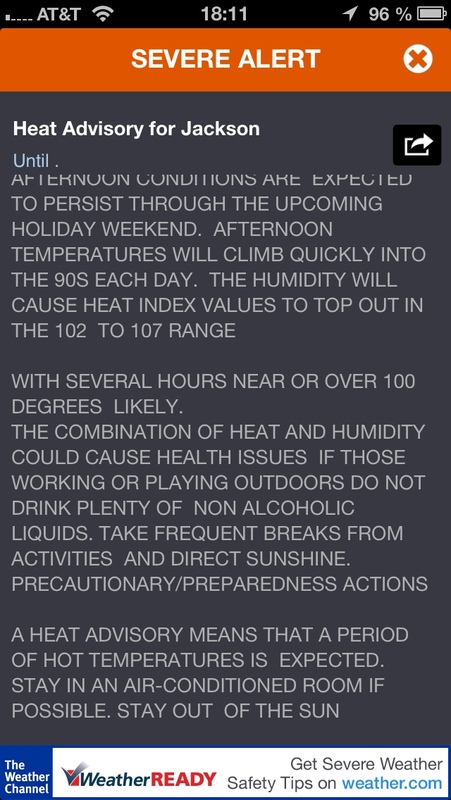 There have been severe heat weather-warnings for the last couple of days and people were advised to stay in airconditioned buildings if being outside can be avoided. Well for my bike-trip, being outside is somewhat crucial and therefore I just try to be as careful as possible. I drink about 12 liters of water each day, the helmet protects me from getting a heatstroke, I take several breaks in the shade and try to get most of my distance done before the afternoon. Today the same motorcycle passed me twice – the first time the guy went really slowly and yelled: “A bit too hot to be doing that today, ain’t it!?”. I just nodded and kept going. 5 minutes later, he passed me again really slowly and handed me an icecold Powerade, gave me thumbs up and took off with his Harley. It was so refreshing since I only had my almost-boiling water left and also such a nice gesture. Speaking of nice gestures: Now that I have completely crossed Kentucky, it is time for a summary. As you know, I didn’t have high expecations and the only thing I knew was that I wanted to get out of Kentucky because of the dogs. But after all, Kentucky was amazing just because of the people! Everyone was really interested and nice. The guy at the dollar-store, where I was getting some water, asked me a lot of questions and was fascinated. He checked out my bike and saw the American flag on my rack. He went in his store and brought another one out that actually had a pole and now I have a more ‘professional’ one. He also offered me a place to stay at the local fire department in New Heaven, but I had to keep going. And then 2 days ago, I took a break in the small town of Utica. There was a gas station with a little diner and I needed to get out of the sun and eat something. Inside, there was a group of 4 construction workers that started talking to me. Of course, they made the usual jokes about why I wasn’t driving a car etc at first, but like all other people, they got really interested in the trip and asked questions. After a couple of minutes, I left them and was going to order food. They left the gas station and one of them came up to me, gave me 10$ and said: “Here is 10 bucks from the state of Kentucky. Have a safe trip!”. I was and still am really fascinated by this. I don’t think this would happen in Germany and it was just great. Then I ordered my food and was going to pay when the cashier tells me that my food has already been paid for and points at this older couple leaving the store to go to their car. What a lucky day and that was the moment when I realized that I might actually miss Kentucky – at least its people. There are several stories like this and it was just a lot of fun. So if the people I have met along the way are reading this: I really appreciated your hospitality and friendliness! The landscape has changed, but it definitely was not flat! I still had about the same amount of climbing as in the mountains, the only difference was that the hills were shorter – not much easier. And whenever there were no hills, the wind kicked in. 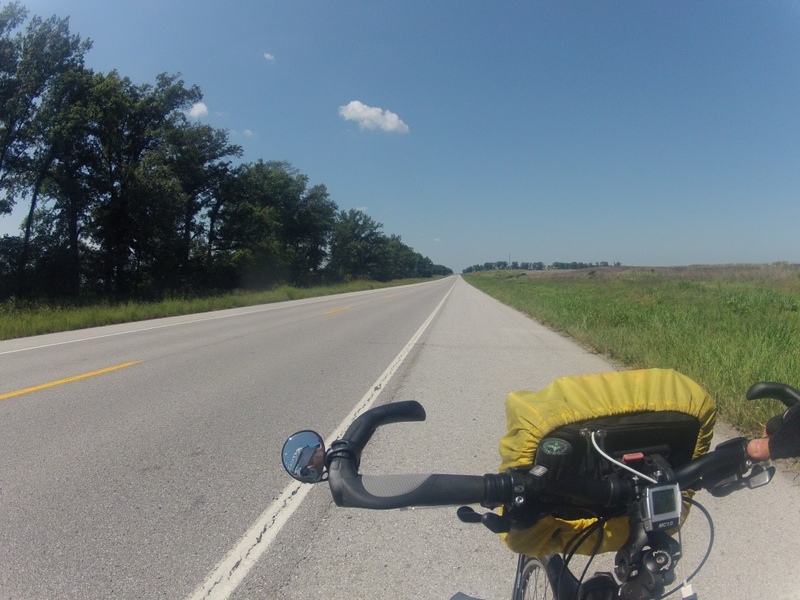 It’s probably a good training for Kansas already where the wind apparently is the westbound-cyclist’s enemy. As soon as you reach the top of one hill, you see the next few – goes on forever! 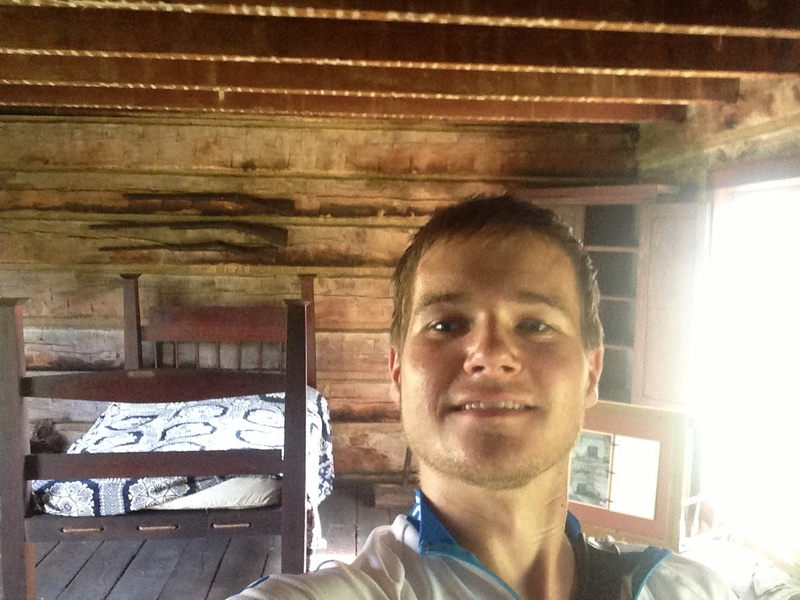 I did pass some historical places along the way as this is the area where Abraham Lincoln was born and grew up. One day I camped right next to his childhood home in the Lincoln Homestead Park and the next day I went to Hodgenville, where he was born. They have a small statue of him there and a museum – neat little town. After a couple of nights of camping, I was happy to have a family to stay with again on tuesday night. 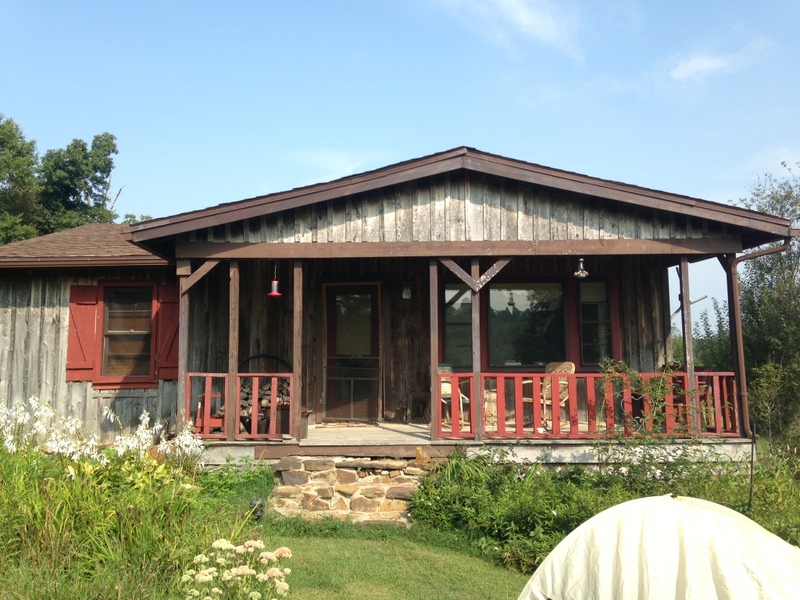 Beth and Garry were great hosts and invited me to spend the night in a cabin on their farm. And then it was time for Sebree. 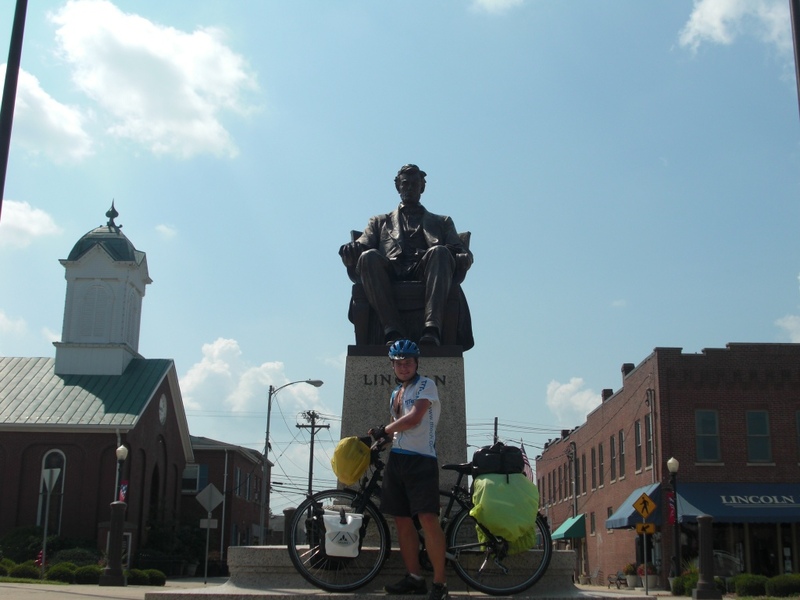 It’s a small town in the West of Kentucky, but I had heard about it from almost all of the cyclists I had met. It has a church cyclists can stay at and the pastor Bob and his wife Violet are supposed to be amazing – and you can forget about the “supposed to be”, because they are! I had a whole basement including, bathroom, pooltable, tabletennis etc, kitchen to myself and most importantly: air condition. They had dinner with me and told me that I could take a shorter route to Illinois than I had planned originally. That way, I could take a day off and do 160km on friday instead of 140 on Thursday and 100 on Friday. It was a done deal and I was looking forward to a day of relaxing. On that day, Bob and Violet actually invited me to go out for dinner with them and to the movies – it was great! 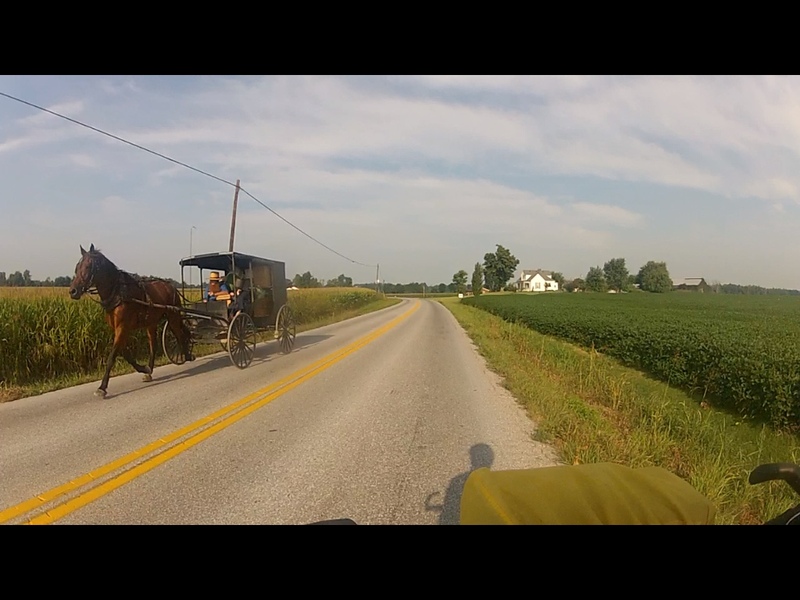 And since the next bigger city was in Indiana, I checked another state of my list although not on my bike. 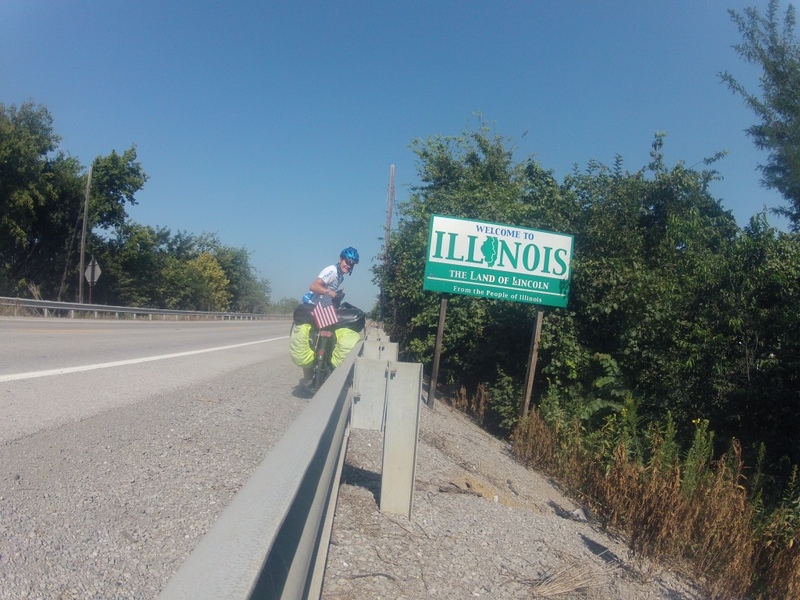 Today – as I have mentioned before- I left Kentucky and went into Illinois. 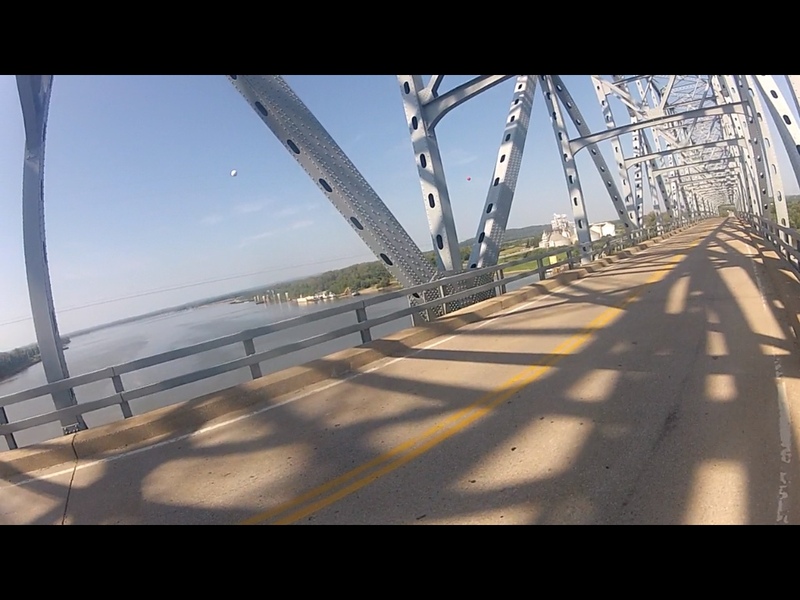 It is crazy, but as soon as I had crossed the bridge over the Ohio River which is the border between the states, the terrain completely changed. For the first time, it was flat! I got really excited and was able to finish my longest stage so far (167km) and probably of the whole trip with the highest average speed of all the days. Maybe it was partly because I tried to go faster so I could have the next water-break sooner – but it definitely felt good to get so many km done in one day. By the end of the day, I was really tired and exhausted and also annoyed because I was riding on a shoulder of a pretty busy highway that had a lot of stones and rocks on it. But the important thing is that I made it! 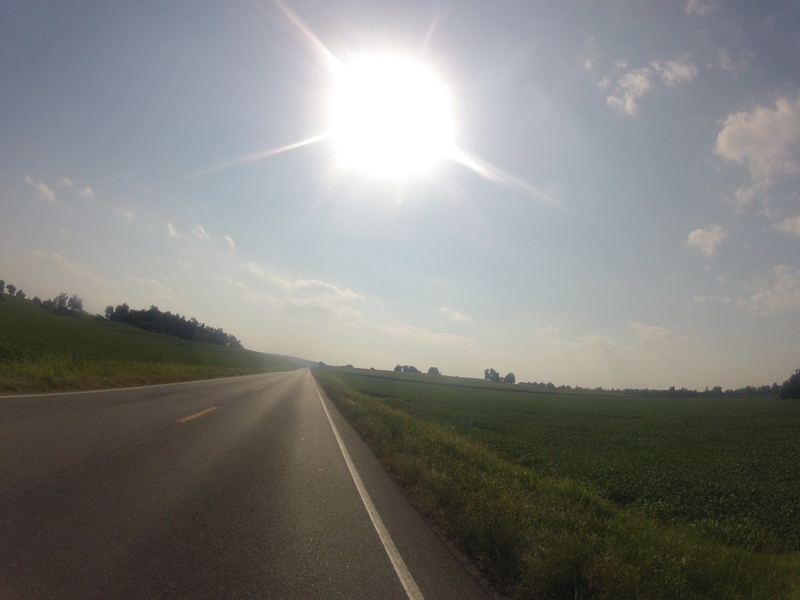 Now, I’m in Carbondale, Illinois and will go to the local bike shop in the morning to get maintenance. I only have about 90km tomorrow so I’m not in a big rush. A short outlook: I will stay at the Mississippi River tomorrow night and cross it on Sunday into Missouri. 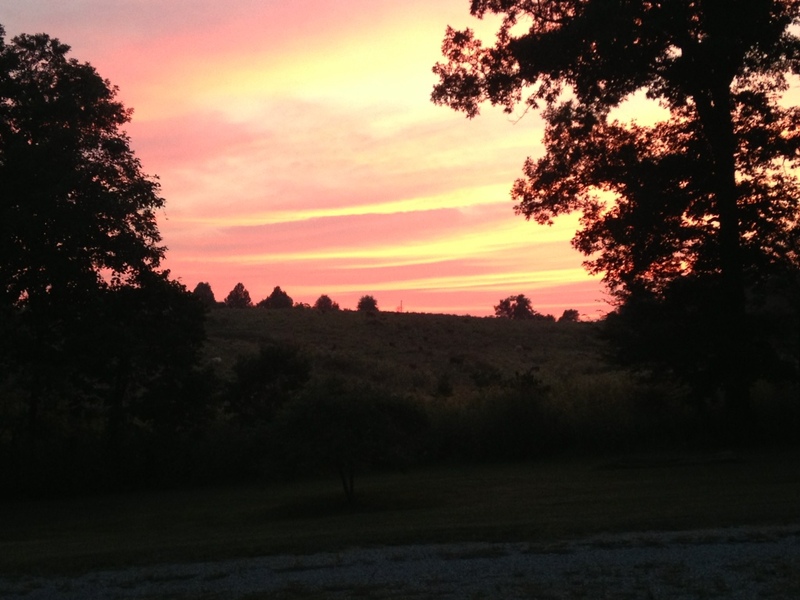 The next mountain range is waiting for me there – the Ozarks. 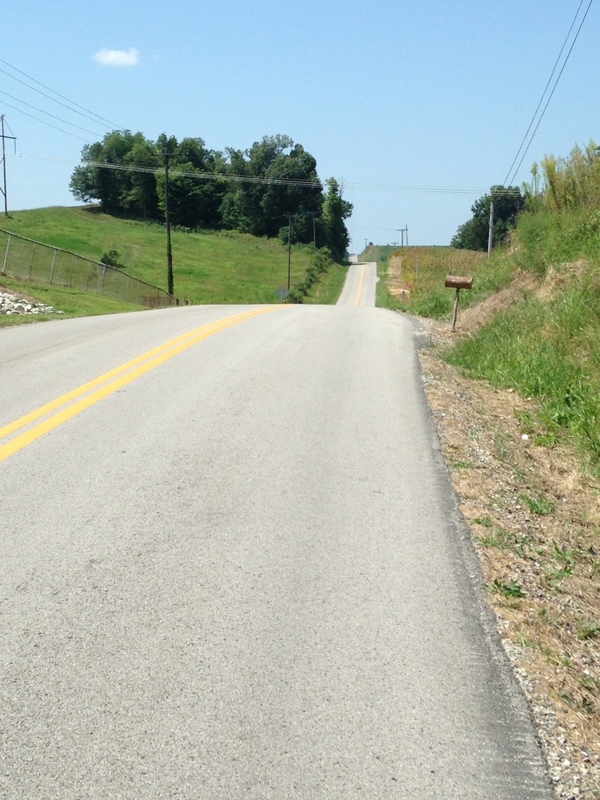 I have heard bad stories about them, because they are supposed to be really steep, but oh well. After that, I will reach Kansas and it looks like I will be at the Rocky Mountains in about 3 weeks – but that’s far away and a lot of stuff could happen along the way (hopefully not). Anyways, that was it for right now and I will try to update the blog again in the next week, but I don’t know if I will have internet in the mountains, so we will see.